Our tangy uncured organic beef summer sausage contains no nitrates or nitrites except those found naturally occurring in celery powder and sea salt. This sausage has all the zip you expect to find when you pop that first sausage-cheese-and-cracker combo into your mouth every Sunday afternoon. Or any other afternoon for that matter. We recommend Organic Valley Pepperjack Cheese! We recommend using within 18 months of the freeze by date on the package, and consuming within 10 days after thawing for best quality. Handling: Our Organic Beef Summer Sausage is ready-to-eat with no heating or cooking required. Simply thaw, and serve. 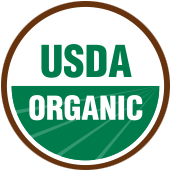 Organic Prairie meats are frozen at the peak of freshness, then individually vacuum sealed in air-tight packages to preserve optimum taste, flavor and freshness. This sausage has all the zip you expect to find when you pop that first sausage-cheese-and-cracker combo into your mouth every Sunday afternoon. Or any other afternoon for that matter. We recommend Organic Valley Pepperjack Cheese!We recommend using within 18 months of the freeze by date on the package, and consuming within 10 days after thawing for best quality. 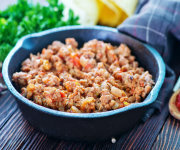 Organic Extra Lean Ground Turkey Breast - Eight 12-oz. pkgs. 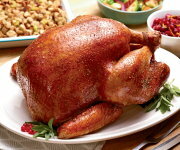 Organic Diced Turkey Breast, Smoked - One - 2 lb. pkg. with Giblets approx. 14 lbs. 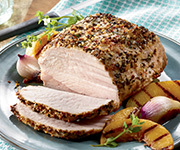 Pork Loin Roast - Six approx. 20-oz. pkgs. I bought four beef summer sausages for my husband's lunch, but snuck a little piece for myself. Oh my. Solid meat, very little fat, and so very tasty. My mouth is smiling! I was CRAZY about summer sausage as a kid. As an adult, I became a vegetarian for awhile then gradually began adding carefully chosen meat back into my diet, mostly fish. I stumbled across this in my organic food cooperative and decided to give it a try. It's PERFECT!! I actually have to limit myself so I don't eat an entire 12 oz block in a matter of days. Yum yum yum. 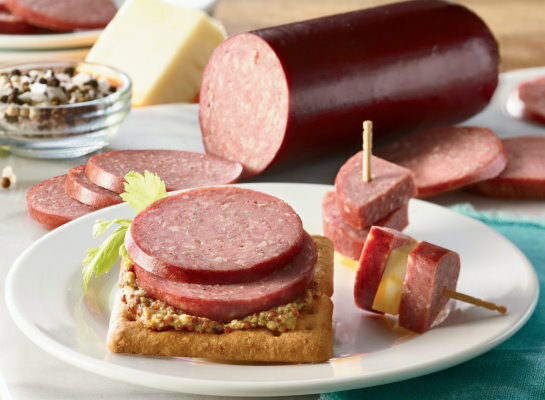 Our persnickety son loves, loves, loves Organic Valley summer sausage for its perfect blend of spices! We looked for a beef salami without nitrates. Ordered Organic Prairie and we absolutely LOVE it. Already at the second salami, so we'll order more in one week. The best we had since 2007 in Germany from a farm!! I have bought steaks, ham, pork chops,summer sausage and all products are superb. Can't get enough of it! Simply the best. Ordered second time, made it double batch. I have always loved summer sausage but gave it up because of all the unhealthy ingredients in it. This summer sausage is guilt free and taste great!!!! I won't be buying any other brand. This sausage is good. I give it as gifts too. I am transitioning to live my life fully and in harmony with all of nature. This means moving away from everything conventional to an all organic way of living. In times of past our ancestors honored the plants and animals that provided nourishment because they knew the energy of the plant and animal will fuse with their energy. A well cared for plant and animal - using only organic ingredients and sustainable practices makes for a positive and healthy me. I am grateful for the farmers of Organic Prairie. 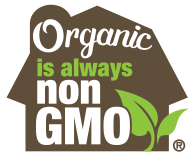 All the foods I have purchased from Organic Prairie are full of flavor and I know full of positive energy. 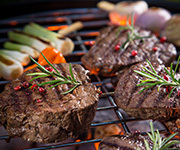 I have enjoyed the beef summer sausage, burgers, chicken, turkey, and specialty sausages. In fact this is THE ONLY place I purchase my meat, they are consistent and reliable. Thank you Organic Prairie!!! Like the beef sticks of old - not greasy at all. Not loaded with fat. Great seasoning and flavor. Definitely will be reordering this. This is delicious! So glad we started to buy from Organic Prairie. We'll be buying all we can from them! Bought this for home and also the snack table for weekly sauna night. Thumbs up from everyone. Good seasoning but not over the top. Solid not too fatty meat. Will definitely order again. Great snack food or appetizer! We have enjoyed everything bought!! Have let many sample the hot dogs, ham and sausage. Everyone loved it!! Thank you!! Firm, fragrant, flavorful! 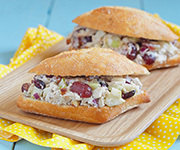 Pairs well with sharp cheddar or pepper jack cheese. That it is also organic makes this my go-to sausage. We love this summer sausage and the roasted garlic variety. Too bad the prices have climbed so high, we probably won't be able to get them anymore. We absolutely love how this tastes. Just the right amount of seasoning! Awesome taste and best of all its ORGANIC! This is great tasting meat. Great on our party platter. This summer sausage has a great flavor and texture. It has just the right amount of smoky flavor. The casing comes off easily. And, best of all, it's organic. Order some, worth every bite! Love that there is no sugar of any kind in it, just herbs.. The summer sausage tastes great and love the quality. Placed one sausage on appetizer tray. Ended up serving 3 for 9 people. Overall 6 star. Nothing taste as good as organic does. And this was high quality. Will order again. This is the best summer sausage out there. My family loves it. I love this SS, it is by far the best I have had. I wish they had a sample pack of each flavor to try. I would be more likely to buy more. My family and I love this summer sausages, it's the only brand I will buy! Delicious! This is simply the best summer sausage. We order in bulk and keep it in our freezer. It feels and tastes like real beef, unlike some other brands. It's not quite perfect, as there is the occasional bit of bone or gristle that has to be spit out, but even that seems less common than with other brands I've tried. This is my favorite of every OV product I've tried so far. It tastes great even by itself, it's filling, and because it's pre-cooked, I can just toss it in the microwave for a few minutes to heat and eat. Excellent product. Great care in packaging and delivery times. Love! Excellent flavor and texture. Will buy again. This is quite simply the best organic summer sausage I have ever had the pleasure of eating. I am extremely pleased with everything about this sausage! I am completely sold and will only buy your product for this point forward. The entire experience from purchase to eating has been fantastic. I can hardly wait to host my next party and serve all varieties of your summer sausage. I love the taste but the last shipment that I got expired within 30 days of me getting it. There is no way I could it that much salami in 30 days. Owner Response: Hi Anna, I apologize for the mishap on your order. Someone from our team will be reaching out shortly. This was the best sausage we have ever had! Perfect smooth flavor. We will be buying this again! Love it!